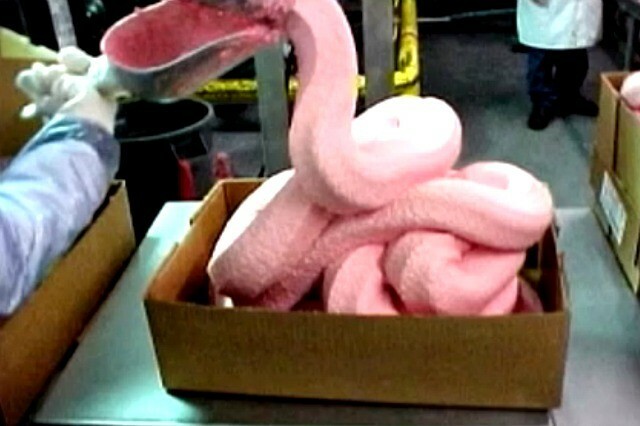 There has been a lot of press and controversy over this "pink slime." Yes I agree it's gross and it's scary because you don't know what's in there. But most of the controversy has been around the fact that they use ammonia gas to treat this meat. Pink slime isn't the problem. It's the symptom of a bigger problem. Pink Slime is not the only food treated with ammonia. Most meat and a lot of other foods are treated with ammonia. Why is this done? Because actually it's done to keep us safe. As gross as the idea of ammonia is, it's better than getting contaminants and bacteria like e. coli. "Escherichia coli, although considered to be part of the normal gut flora for many mammals (including humans), has many strains. Strain E. coli 0157:H7 is associated with human illness (and sometimes death) as a foodborne illness. A study by Cornell University has determined that grass-fed animals have as much as 80% less of this strain of E. coli in their guts than their grain-fed counterparts, though this reduction can be achieved by switching an animal to grass only a few days prior to slaughter. Also, the amount of E. coli they do have is much less likely to survive our first-line defense against infection: stomach acid. This is because feeding grain to cattle makes their normally pH-neutral digestive tract abnormally acidic; over time, the pathogenic E. coli becomes acid-resistant. If humans ingest this acid-resistant E. coli via grain-feed beef, a large number of them may survive past the stomach, causing an infection"
So if pink slime and ammonia is the symptom, what's the problem? E. coli in food. What's the source? According to Michael Pollan, author of The Omnivore's Dillemna and In Defense Of Food, he says that cows were never evolved to eat corn or grains. It's the reason why this highly acid resistant E. coli strain is so rampant. Feeding them grass again, the food they were meant to eat would clean up 80% of the E. coli in their gut in a week. This was also mentioned in the movie Food Inc. So pink slime is not the enemy. Neither is ammonia. It's the fact that we feed cows corn, grain, and soy. They would sometimes feed them meat of dead cows, that led to Mad Cow Disease. Just feed them what they were meant to eat, grass. Lately because corn is getting a black eye, they are feeding them other grains, and soy. Soy is now being pushed down our throats as the next healthy thing. It just happens to be very genetically modified and very cheap to produce. How interesting whatever there is an abundance of and cheap to make, we say it's good for you. How do we stop this problem? We vote as consumers. Purchase grass fed meat products and organic and non-GMO. A final thought. If cows were never evolved to eat corn and grains and soy, even with their multi-chambered herbivorous stomachs, why are we humans eating so much of it and told to eat so much of it? Coach Sam Y. is a Master Personal Trainer, Coach, Certified Nutritionist, Performance Enhancement Specialist, Corrective Enhancement Specialist, Pilates and Yoga instructor, and holds multiple certifications. He is also an avid Martial Artist, training in Brazilian Jiu Jitsu, Kickboxing, Boxing, and MMA. He is also the author of the popular fitness blog All Out Effort as well as the popular martial arts blog Inner BJJ. You can find him in the Los Angeles area personal training his clients, or at home annoying his wife, or on Facebook and Pinterests.